This quick and easy but so tasteful grilled sandwich or ‘panino’ (the Italian name for grilled sandwich on press) will satisfy any palate! Easy to assemble and to prepare, it requires, when shopping with a grilled sandwich in mind, to pay attention to few important details and ingredients like the panini press, but mainly the bread! Inspired, while reading an article about sandwiches by Daniel Leader, a great baker in the Catskills, NY, and having some good roast beef leftovers, I was able to put together and share with you a really great grilled beef sandwich recipe. It is easier than you think to be creative with some leftovers, good slices of bread, and a panini press! One last word, roast beef works well here but grilled steaks slices or ground beef patties will do even better! Heat the sandwich press well hot. Brush your steaks or patties with 1 or 2 tablespoons of olive oil, salt and pepper and grill them 3 minutes till cooked through on the press or on ‘grill’ skillet or a medium size skillet. Remove from heat and set aside. 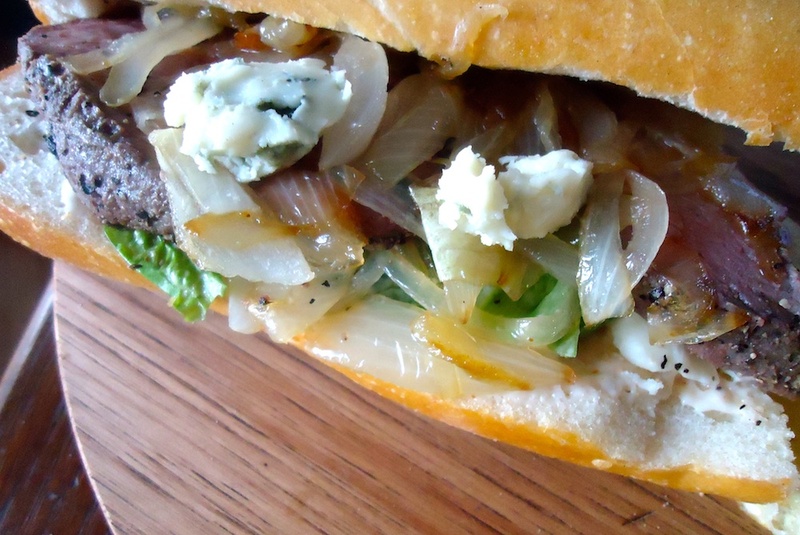 While steaks are grilling, prepare a 1/3 of french baguette (bought at at Panera’s bread) about 6 inches long split in half, then spread with a butter knife 1 teaspoon of red pepper mayonnaise, add few caramelized onions, lay over the onions steaks or sliced roast beef, top with few onions at your taste, add Ceasar salad and blue cheese crumbles. Top well with remaining half, place on the press, pulling the top down, cook till browned till crisp. Remove sandwiches and serve with potato chips or fries.